I'm collecting a list of resources, articles, and calculators related to the Blended Retirement System (BRS). Check it out for the most up to date information. Up to 5% base pay match for TSP contributions. 1% automatic DoD contribution regardless of member's contribution. Retirement pension is now calculated as years served x 2.0% x retired base pay. So if you serve 20 years, you get 40% of your highest 36 months of average base pay. Continuation pay bonus is now paid out at between 8-12 years, 2.5x – 13x monthly base pay. Standby for more details on this. Anyone with less than 12 years of service as of 31 Dec 2017 is eligible to sign up. Opt in period is calendar year 2018. Here’s what we know about the new U.S. Uniformed Services (Army, Navy, Marines, Air Force, Coast Guard, NOAA, and US Public Health Service Commissioned Corps) Blended Retirement System. Authorized in the 2016 National Defense Authorization Act (NDAA), the new military retirement system is the most radical change since the Career Status Bonus/REDUX scheme passed by Congress in 1986. The CSB/REDUX plan was an absolutely terrible deal for troops. The new retirement system is actually quite a good deal, especially for the 83% of the force that leaves before the current 20 year retirement cut off. 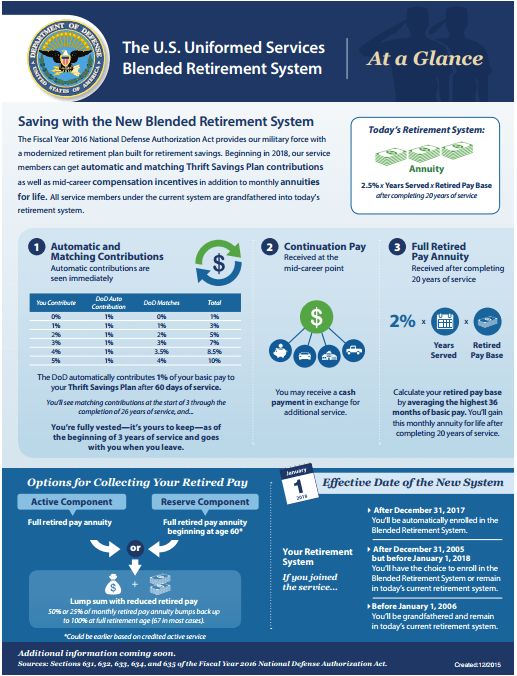 The new Blended Retirement System (BRS) will be fully implemented on January 1, 2018 for all troops enlisting or commissioning after that date. Servicemembers with 12 or less years of service on Dec 31, 2018 (those who joined after Dec 31, 2005) or who join before Jan 1, 2018 will be given the option to opt into the new retirement plan. This opt-in period will be during calendar year 2018. Of course, this raises the question of whether you should opt in or not. Bottom line: if you are not sure if you will stay in for 20 years, the new BRS system offers you additional retirement savings that can substantially increase your retirement income. If you are 100% sure you’ll stay in for 20, stick with the old plan. There’s a 83% chance you won’t make 20 years and the new plan offers many monetary benefits to those who get out before their 20 years. The old military retirement system consisted of the Thrift Savings Plan (TSP) (with no matching) and a pension that began immediately upon retirement, calculated at 50% of the average base pay for the last 3 years of the servicemember’s career. This is a great scheme for those who make it to 20 years. But it leaves the 83% of the armed forces that doesn’t make it to 20 years without any retirement benefits outside of their personal savings into the TSP and IRAs. 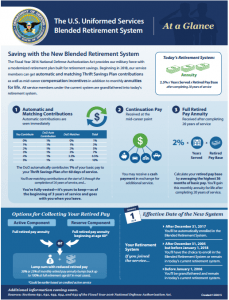 The Blended Retirement System will change the system for the better and offer every servicemember retirement savings that they can take with them no matter how long they serve. This is calculated by taking the average of your highest 36 months of base pay (usually the last 3 years of your career). Remember, in both old and new systems this is only calculated off your base pay, not any special pays you received or your BAH, which could make up a large percentage of your income on active duty. In the new system the multiplier has changed to 2.0%. 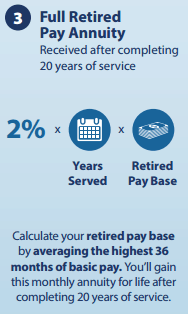 Now if you served and retired at 20 years, you will receive 40% of your retired base pay. This means that you will receive a 20% reduction in your pension, which could cost you hundreds of thousands of dollars over your lifetime. However, with proper investment of the other two pillars of the new retirement scheme, you can potentially close the pension gap between the new and the old scheme. Besides, the pension gap is only a player if you make it to 20 years. Already available to civilian government employees, the TSP match is the best improvement of the BRS. 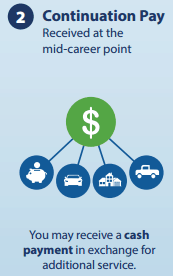 The Thrift Savings Plan is already the best retirement account in the world. 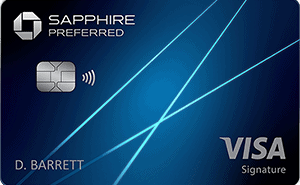 Now with matching, it becomes an even more powerful savings vehicle. The TSP offers simple and diversified index funds at the lowest costs available in the world. If you're not taking advantage of this program already, you need to start ASAP. Under the new system, every recruit will be automatically enrolled with 3% of their base pay going into the TSP. After 60 days of service, the DoD will automatically begin kicking in an additional 1% of their base pay until the member separates, retires, or reaches 26 years of service. This addes up to 4% total (3% from servicemember's base pay + 1% DoD) of the servicemember’s base pay going into the TSP. Additionally, after 2 years of service the DoD will match up to an additional 4% of the servicemember’s basic pay. This is on top of the 1% automatic contribution. The maxmimum match is 5% if the servicemember is also contributing 5% of their base pay. This matching is already widely used in the civilian sector so it’s good to see it coming to the military side. This TSP match could mean $70,000+ of additional savings into your TSP, assuming you serve for 20 years. At retirement age of 60, these extra invested assets means you'll have a retirement account of $1 million, rather than half a million (assuming a 7% return). Total contributed = $6648, or 10% of total annual base pay. The continuation pay is an incentive for military servicemembers to stick around to least 16 years, usually past their initial enlistment or active duty service commitment (ADSC). Initial enlistments and ADSCs range between 2 years for new enlisted personnel and 10 years for Air Force pilots. Re-enlistments also range widely in length. In the current system, there is no retirement advantage to staying another year, other than re-enlistment bonuses and pay raises. Now with the new continuation pay benefit, there’s a monetary incentive to stick around past your initial service commitment but not necessarily until the 20 year point. For a 12 year Army or Air Force major or Navy lieutenant commander (O-4), the value of this bonus pay in 2016 would be $17702.50 at 2.5x monthly pay. For a 12 year E-4 or E-6, the value of the continuation pay would be between $8000-$9000. The continuation pay will most likely be taxable, unless the servicemember is eligible for the combat zone tax exclusion (CZTE). Also, the smart servicemember will invest this pay immediately into their TSP. By adding this money to the TSP, you will significantly increase your retirement income. So, is the new military retirement a good deal? I believe that while the 20 year, 50% of base pay pension is a fantastically good deal for military servicemembers, the new plan offers many opportunities for the smart investing servicemember. If the match is utilized to it’s full potential, the difference between the new plan and the old plan shrinks substantially. However, the new plan does rely much more on the servicemember to invest smartly over the course of their career, in a properly diversified portfolio with enough equities to provide a decent (6%+) return. Just sticking with the G Fund is the wrong approach to maximizing your returns over the lifetime of your investments. Personally, I will be signing up for the new plan. I believe the uncertainty of staying for 20 years and the additional benefits (TSP matching and continuation pay) are worth sacrificing a potential 20% cut in pension pay. Remember, only 17% of the total force sticks around for a full 20+ years. At 6 years in, there’s no guarantee that I’ll be able to stay in for the full 20, whether it’s for family, personal, or professional reasons. The flexibility the new plan offers makes it worth it to me to sacrifice 20% of a pension I will probably never receive. So, if you’re eligible, are you going to opt in to the new plan? Or will you stick with the old plan and aim for 20 years of service? I would be interested to hear what DOD is saving by moving in this direction. Over the years it has become increasing difficult to maintain the retirement spending as part of their budgets. What are the projected DOD savings and why not give a choice at eight years for one plan or the other? It seems as though there is a lot of ambiguity on whether it is beneficial or not to opt into the BRS if the service member has between 8-10 years of active service in 2018. 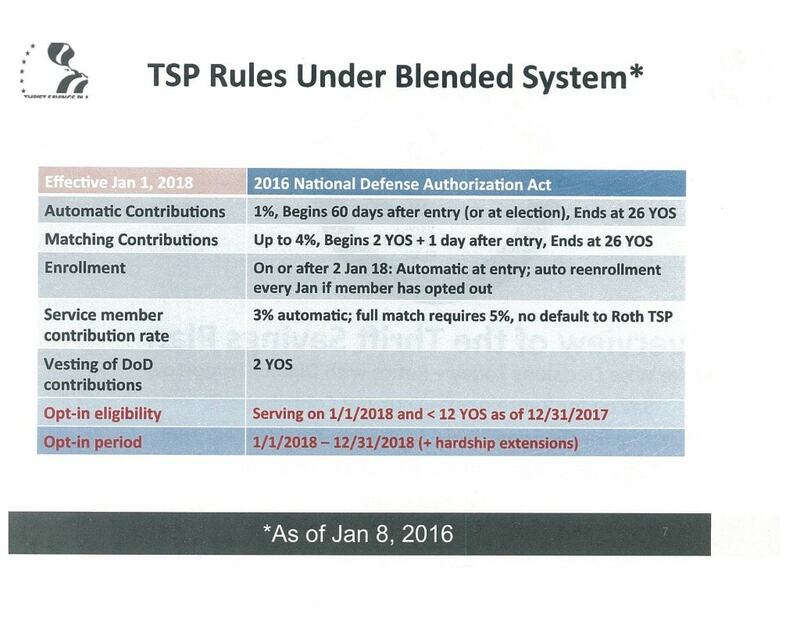 Obviously if the service member leaves the service before 20 years the BRS is preferred due to participation in at least some TSP matching contributions. However if one is reasonably assured they would serve 20 years the traditional high three system offers a much higher payout over an average (80-90 year) lifespan, even if the service member retires from reserves (although the difference is much smaller due to pension payout beginning at 60 years of age). What is your advice for service members with 8-10 years of active service in 2018 considering the percent of service members who reach 20 years (active or reserve) is significantly higher with each year of service? Also, the DOD BRS calculator seams misleading in that it counts ones personal TSP contributions and projected growth into the total BRS payout. This money would be the service member’s regardless of which system is chosen. Should this money be ignored in determining which retirement option is better? I took the online training for this but your explanation kinda helped it to make more sense. I will hit 12 years in February of 2017 so I’m thinking that when this rolls out next January I can still capitalize on switching over? I plan to do 20 years however recent knee injuries could possibly change that, I’m not sure. Would it be wise to switch? I recently started a TSP account and have less than $2000 in there, so the DOD contributions wouldn’t be a bad idea. And the continuation pay even after taxes would be a nice bonus to put into a savings account. I’m not well versed on the G funds and life cycle things you spoke of. What do you think? If you plan on doing 20 years or might get medically retired, I would stick with the old plan, especially since you are almost at 12 years. Read up a bit on the Lifecycle funds. I would move your money in the TSP immediately to something higher reward/risk than the G Fund. If you may get out before 20 years, the new plan could offer some good flexibility. Nice write up. One question: how is it a 20% reduction in retirement annuity and not 10%? Am I missing something? .1 / .5 = .2 or 20%. In real numbers, if your base pay was $1000/month when retired, under the old system you would receive $500. In the new system at 40% you’ll receive $400. Original amount minus new amount divided by original amount equals percentage change. ($500 – $400)/$500 = 20% drop. Great write up sir, just a few questions. Are you fully vested after two years of three years of service? I have heard differing opinions, but I believe its at the start of the third years of service to be fully vest in the 5% matching. 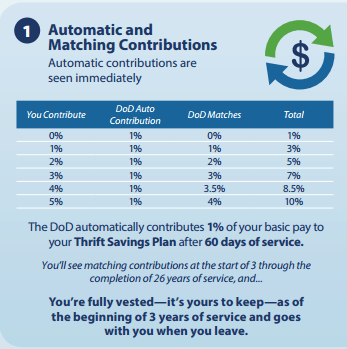 I commissioned in late 14 and went on active duty in early 15, I am very excited for this new retirement plan, and feel I joined at what seems to be the perfect time to max out the years of percent matching to my TSP. Secondly, I currently invest solely in Vanguard and do not have any TSP contributions set up. 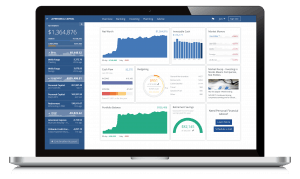 Do you recommend staying solely with Vanguard and start my TSP when matching becomes available and I am therefore automatically enrolled, or should I start my TSP now and reduce my monthly contributions to my Vanguard account? Thank you. Currently the proposal is full vesting after 3 years of service. The TSP’s extremely low costs slightly edge out Vanguard in my book but a Vanguard IRA (Roth or Traditional) does offer more flexibility than the TSP. Rather than reducing your monthly contributions to your Vanguard account, can you start contributing 5% to your TSP account and keep your Vanguard contributions the same? If not, split the difference and contribute equally to your Vanguard retirement accounts and the TSP until you’re maxing your IRAs. Then try to max the TSP contributions. Bad idea! The annual limit on TSP contributions this year is $18,000, and is indexed each year. If a servicemember puts their continuation bonus in the TSP, they run the real risk of quickly hitting the annual cap. When that happens, their base pay contributions would stop going into the TSP, and they would lose out on the rest of the year’s matching contributions from the DoD. So DO NOT just blindly put all of your continuation pay into the TSP. Wouldn’t the DoD match up to 5% of your pay, which for a O-4 in 2016 would be around $4000, and deposit that full amount when you contribute your continuation bonus? I don’t think they care if the contribution comes from your base pay or your bonus pay. If you have any evidence to the contrary, please let me know. Since the system is not in place yet we can’t ask anyone how it works. Maxing out your contribution in the beginning of the year or as soon as possible gives your investments another year to grow (Google the Vanguard study on dollar cost averaging vs. lump sum investing). Plus it gives you the opportunity to maximize your TSP contributions if you deploy and perhaps hit the elusive $53,000 contribution. I checked with my finance office. The match is *per month* – if you max out early, you lose the match for any remaining months of the year. You will still, however, get the 1% automatic contribution. Yes, that checks with what I hear as well. Thanks for the great summary of the new plan. I’m over 20…so it won’t impact me, but I need to start advising my folks. For a while they were considering delaying the pension payout to a later age…55 or 60…looks like it’ll be immediate upon retirement like it is today? I plan on several “brown bags” with my folks over the next couple of years to discuss the options as they’re faced with this decision. As of now the plan is start pension immediately for active duty folks. Guard/reserve will be different, just like it is today. So in 2018 I will have 12 years in of september of that year, I have TSP and there is a little over 10 grand in there. I do plan on staying in for 20years. I have invested heavly in the G fund and lifecycle funds, would it be better to switch to this new plan to diversify my portfoilio? If you plan on staying for 20 years, stick with the old plan. You don’t have enough time to invest and make up the difference with the TSP matching. Secondly, take a hard look at your asset allocation. If you’re mixing G Fund and multiple Lifecycle Funds, you probably are not on the efficient frontier and too heavily invested in government bonds (G Fund). Check out the Bogleheads wiki on asset allocation, lots of good information there. Here’s my asset allocation as of 2014, I’ll be writing a new post on my 2016 allocation soon. Great writeup! I will be passing this around to coworkers and making a presentation around the end of 2017 to explain the choice to people. You sold me on changing to the new plan for the flexibility. I will be doing the math comparing the 5% matching I’d lose by switching 6 years in to compare apples to apples for my specific situation. Thank you for the detailed info!